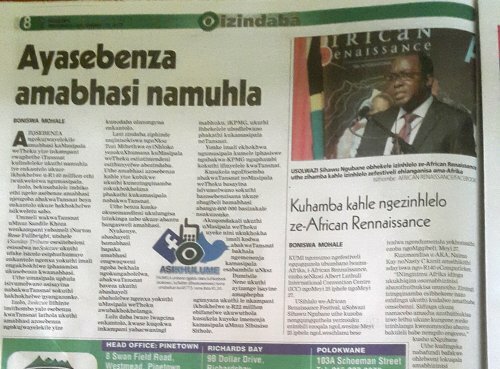 The 19th edition of the annual African Renaissance Festival will be hosted at the Inkosi Albert Luthuli International Convention Centre (Durban ICC) from the 25 to 27 May 2017. The Festival includes a two day conference to be held on Thursday 25 and Friday 26 May and a concert, which will be held on the 27 May. 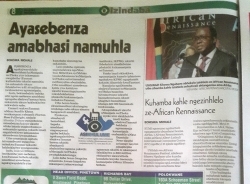 Chair of the African Renaissance organising committee, Prof Sihawu Ngubane, said that conference programme will focus on entrepreneurial development. He says, "South Africa needs to build a dynamic culture of entrepreneurship, currently the country is lagging behind other developing countries in this area. Entrepreneurs are key to addressing our many social and economic challenges." In addition, the country needs to find innovative means of achieving the United Nations' sustainable development goals to which the South African National Development Plan is aligned. Goal eight states: "Promote sustained, inclusive and sustainable economic growth, full and productive employment and decent work for all." The ultimate goal for the development of entrepreneurship is to promote economic growth and create a better life for all South Africans. "While many people are able to act and think independently, others need assistance in developing a mindset that embraces change and new possibilities. In order to order to facilitate growth in the number of entrepreneurs, there needs to be an active involvement in training students in entrepreneurship and innovation by all disciplines at our tertiary education institutions," said Prof Ngubane. The African Renaissance Conference will also provide information for scholars and students to study abroad through the variety of international exchange opportunities that are offered by foreign governments and other institutions. Many scholars and students are not aware of the funding options that are available to them and often the available bursaries are not utilised each year. This aspect will build on the momentum already gained by the KZN Youth International Scholarship and Exchange Programme, which was launched in October 2016. The website www.kznyis.gov.za and Facebook page provide current information on available international study opportunities. These bursaries and grants provide incredible opportunities for students from undergraduate to post graduate study levels in a wide range of disciplines. Prof Ngubane said, "Access to international education opportunities is an essential element in the exposure of our youth to new knowledge, the advancement of ideas as well as successful participation in the global world. Start planning very early in your school and student years to take up these bursaries and don't limit your dreams." Educators, parents, and scholars ─ particularly those who are high academic achievers − are encouraged to apply to register for the conference. Admission to the conference is free, however space is limited. Details of the application and registration process will be available in the media and on the African renaissance conference website http://www.africanrenaissance.net/. The African Renaissance Concert will take place at the Durban ICC on the 27 May. Tickets will be available at Computicket.